Roman Catholic Church of Saint Charles Borromeo is at 8 Ogle Street, on the western side, close to the junction with New Cavendish Street in Marylebone. 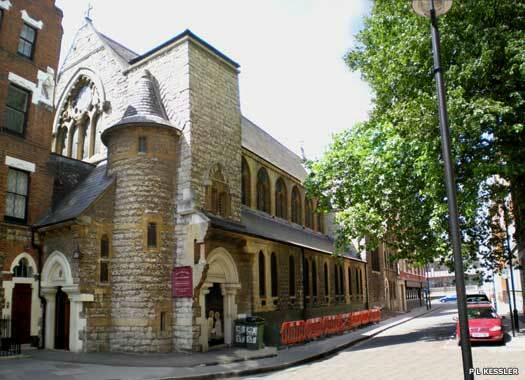 The parish was founded in 1862 to serve the Catholic residents of the Marylebone Deanery. The church itself was built by T J Wilson & S J Nicholl in 1863, on donated land. It was in the Gothic style and with an Early English appearance that was deliberately medieval. It was consecrated on 4 October 1921. 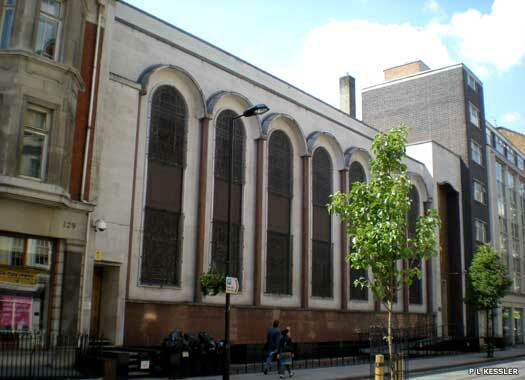 Central Synagogue stands on the western side of Great Portland Street, immediately north of the junction with New Cavendish Street. 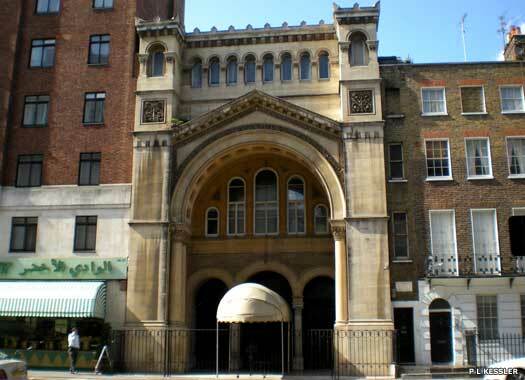 A temporary synagogue was erected along Great Portland Street in 1855 as an offshoot of the Great Synagogue Dukes Place. This was replaced by the first synagogue on the present site in 1870. That building was destroyed on 10 May 1941 and the present building was erected in 1956-1958, and consecrated on 4 February 1958. Holy Trinity Marylebone Road stands on an island plot opposite Great Portland Street Underground. 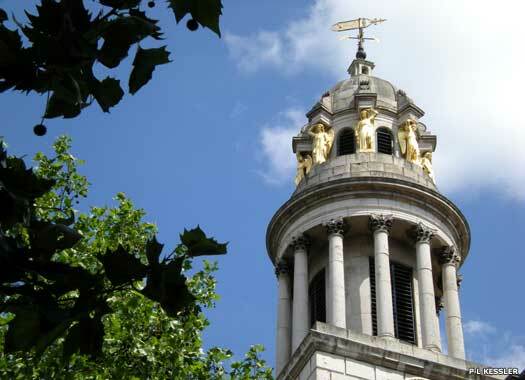 The church was built in 1828 by Sir John Soane, funded by money set aside by the government to celebrate the 1815 defeat of Napoleon Bonaparte, the so-called 'Waterloo Churches'. 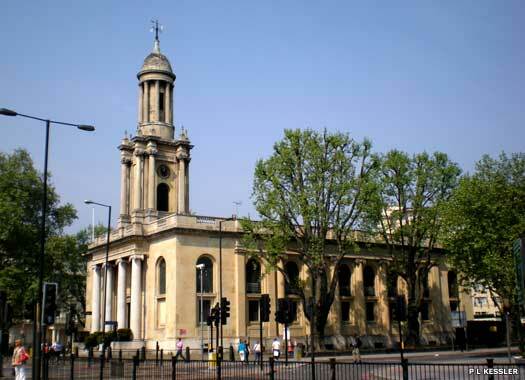 It had closed by 1937, and the parish was united to that of St Marylebone Parish Church (see below). 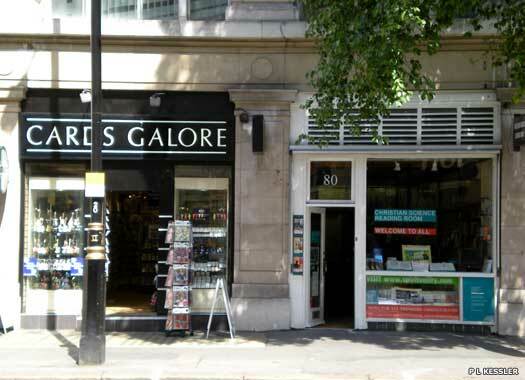 Then it served as the headquarters of SPCK until it was converted into offices in 2004. 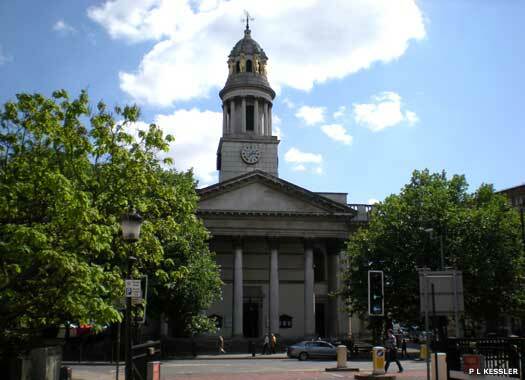 St Marylebone Parish Church is at the south-east corner of Oldbury Place and Marylebone Road, directly opposite York Gate and Regent's Park. The first St Marylebone was the parish church of Tyburn village and stood near the site of Marble Arch. This was demolished in 1400 and the second parish church, St Mary the Virgin, was built on Marylebone High Street, by the bourne. This was the 'Ty bourne', or River Tyburn, and St Mary by the bourne mutated into Marylebone. This second church building was replaced in 1740 with another small church on the same site. Charles Wesley (1707-1788) was buried here and a memorial stone to him still stands in the gardens on the High Street, close to where he was buried. 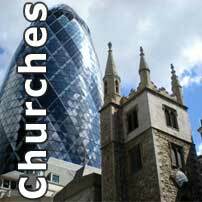 The present church was built on a new site and consecrated in 1817, to serve the increased population of the now-gentrified Marylebone area. Bomb damage blew out all the windows, but full repairs were completed in 1949. Eleventh Church of Christ Scientist Baker Street is on the eastern side of the street (on the right in this photo), a few metres north of Dorset Street. This Christian Science church is part of a worldwide movement founded by Mary Baker Eddy (1821-1910), in Boston, Massachusetts in the USA in 1879. She was credited with having the power to heal instantaneously. The 'church' itself is a simple high street shop that has been converted for the purpose of worship. The former Eleventh Church Of Christ Scientist is on the northern side of Nutford Place, with Brown Street to the west (on the left) and Seymour Place to the east. In 2010 the building was taken over as the Sylvia Young Theatre School, converted into a five-floor dance academy. About seventy metres to the west (left) lay the lost St Luke Nutford Place, opened in 1864, considered excess to requirements after the war, and closed in 1947. Nothing remains. 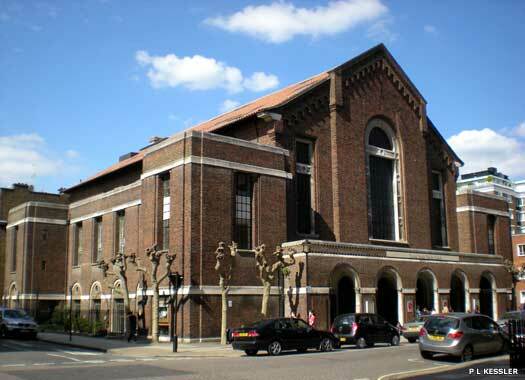 West London Synagogue of British Jews is behind the buildings fronting the north-west corner of Seymour Place and Upper Barkley Street. The main entrance is on Upper Barkley Street and there is a side entrance on Seymour Place. This reform synagogue community was founded in 1840, partly as an attempt to unite Sephardim and Ashkenazim Jews. They lived in two different West End premises until this Grade II listed building was consecrated in September 1870. 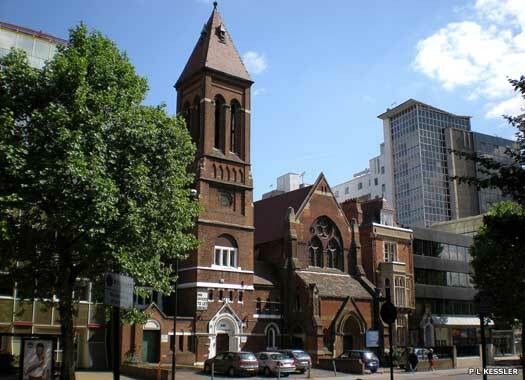 The Adventist Centre, Seventh-Day Adventist Church stands close to the south-east corner of Crawford Place and Brendon Street, within sight of the Edgware Road. Although there is little data to confirm it, the building seems to have been erected as Trinity Baptist Chapel, Crawford Place, with registers covering marriages between 1932-1934 available at least. The date of closure is unknown, but the Seventh-Day Adventists gained the building after 1991. The Parish Church of St Mark Old Marylebone Road is on the southern side of Old Marylebone Road, opposite Cabbell Street. The church was opened in 1872. It closed about 1980 and its parish was united to St Paul Rossmore Road. 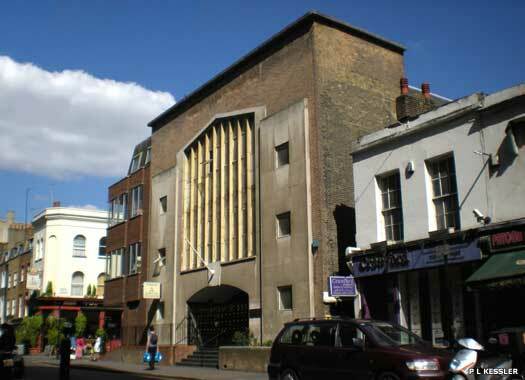 The building was used as Old Marylebone Road United Reformed Church and the Ivory Coast Baptist Church around 1988, with them seemingly sharing the premises. It now serves as a chapel of ease to St Mary Bryanston Square. Additional information provided by Garry Barr.